Melissa McCarthy wears black high top Converse “Chuck Taylor” All Stars in the film. There’ve been some mysterious sightings around New York, so the Ghostbusters are called in to get to the bottom of it. Hollywood has been fixated lately with the idea of reboots. The film landscape has been riddled with remakes and relaunches of classic films and franchises from yesteryear. Some have been wildly successful, while others have flopped upon arrival. However, none of these reboots have been as divisive and controversial as the reboot of the Ghostbusters franchise. A third Ghostbusters film has been in development ever since the release of Ghostbusters II, but the idea was ultimately abandoned with the death of original Ghostbuster Harold Ramis in 2014. This lead to Columbia exploring other options, ultimately deciding to reboot the series with an all female cast. There was immediately backlash from Ghostbuster purists and other online commentators about how this would ruin the franchise and sully the legacy of the original film. The trailer became the most disliked video on Youtube, and many wondered what the fate of this film would be? Would it even make it to release and what direction would this all female cast take the franchise? The group gets ready to test their new weapons and gear. The film, much like the original, is set in New York City, and quickly introduces us to our new Ghostbusters. Abby Yates (Melissa McCarthy) and Erin Gilbert (Kristen Wiig) once co-authored a book that presented the existence of ghosts as fact. Erin has since disowned the work, and has become a Physics professor at Columbia University. 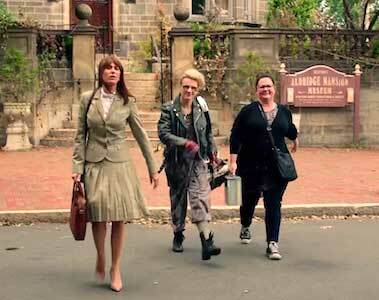 Abby continues to study the paranormal at a technical college with engineer Jillian “Holtz” Holtzmann (Kate McKinnon). Erin learns Abby has republished the book, which threatens her attempt to gain tenure at Columbia. In order to get Abby to remove the book from publication, she has to help her and Jillian complete a paranormal investigation. Erin agrees, and their investigation begins. Abby gets thrown into a wall by her proton pack. During their investigation, the group witness a malevolent ghost which restores Erin’s belief in the paranormal. However, this leads to Erin getting fired from Columbia, as people view their video evidence as fake. She joins Abby and Jillian’s project full-time, and they open a small office above a Chinese restaurant. They build equipment, tools, and gear to study and capture ghosts, and eventually hire a dimwitted receptionist named Kevin Beckman (Chris Hemsworth). MTA employee Patty Tolan (Leslie Jones) witnesses a ghost in the subway, and contacts the group. They investigate, and successfully test their equipment, including Holtz’s proton containment laser. However, their findings are again dismissed as being a hoax. They continue their investigations, and are eventually dubbed the “Ghostbusters” by the media. Patty becomes the team’s first recruit, providing knowledge of New York City’s layout and history. She also secures the group a repurposed hearse, dubbed “Ecto-1”. Unbeknownst to the Ghostbusters, these ghosts are being summoned by Rowan North, an occultist attempting to bring about the apocalypse. Their paths soon cross, and leads the Ghostbusters to a showdown to save New York. The gang heads into the concert to do some busting. This film doesn’t necessarily deserve the sheer amount of backlash it received upon its announcement and release. Is it a great film? No. Is it a horrible film that deserves all of the scorn it got? Absolutely not. It’s a perfectly fine film that has flaws, but doesn’t warrant extreme vitriol. The performances from McKinnon, Hemsworth, and Wiig are a highlight, with McKinnon stealing almost every scene she’s in. Another positive is the visual effects. The VFX department did a stellar job, making the ghosts look scary yet breathtaking. The negatives include much of the comedy being hit and miss, and some plot holes that go beyond suspension of disbelief. Some of the jokes aren’t great, and the film revolves around slapstick comedy with McCarthy far too often. However, those negatives don’t diminish what a solid effort the film is. If this movie was not titled Ghostbusters, and had just been a different paranormal comedy titled absolutely anything else, it wouldn’t have received the hate and backlash it did. Melissa McCarthy crowd surfs in a pair of black chucks. 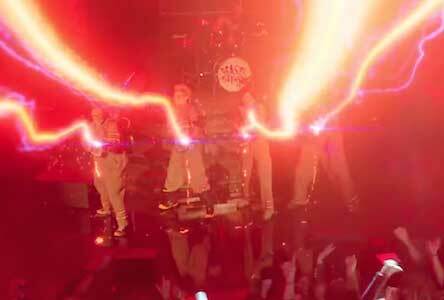 The best chucks scene in the film is a scene in which the newly formed Ghostbusters investigate a report of paranormal activity at a 24 hour Metal Marathon Concert. 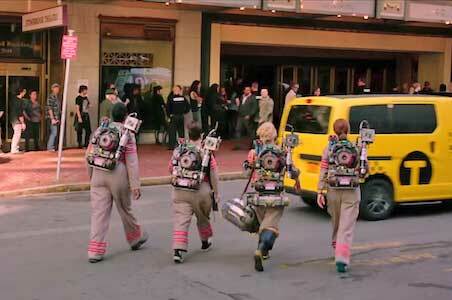 This is the first time that we get to see the crew in their full Ghostbuster regalia. Melissa McCarthy pairs her coveralls with a pair of classic, black high top chucks. We get to see these very well in this scene as McCarthy crowd surfs with her feet clear in the air. 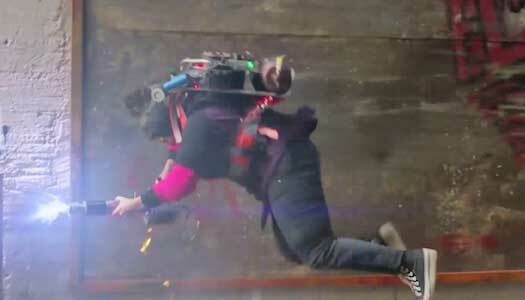 We also get to see them in a wide shot where the Ghostbusters use their proton packs to subdue the ghost. This is a great scene and it’s awesome to see this group finally come into their own. Ghostbusters. (2016) Melissa McCarthy, Kristen Wiig, Kate McKinnon, Chris Hemsworth, Leslie Jones. Directed by Paul Feig. Categories: Comedy, Action/Adventure, Science Fiction/Fantasy.